Despite environmentalist's love for salty snacks, many food manufacturers do not "go green." Frito-Lay’s Casa Grande facility plant in Arizona, PepsiCo’s North America division, is a different story. The firm launched an ambitious sustainability project, the "near net zero" effort that took a production facility "off the grid," running primarily on renewable energy sources and recycled water, while producing nearly zero landfill waste. Food manufacturers and other businesses rely on key natural resources -- water, fuel and gas -- whose scarcity will affect everyone. Frito-Lay developed strategies to ensure sustainable business practices, even in the Arizona desert, where there are severe constraints on these resources. “We made significant investment in our renewable-energy technology. In the summer, we installed a large-scale biomass boiler, using wood waste and agricultural debris to generate all our steam. We installed about 5 megawatts of photovoltaics. In that investment, we’ve partnered with local utility Arizona Public Service, along with the third-party provider, but we also invested our own capital into the photovoltaic system that produces power from the single-axis trackers, as well as dual-axis trackers. Frito-Lay also invested in water recovery that allows us to recycle 75 percent of all the process water,” explained Al Halvorsen, senior director of environmental sustainability, Frito-Lay North America, who added that this effort is part of a commitment to a long-term vision to use renewable energy and to recycle water. Frito-Lay has been using innovative technologies since the 1960s and '70s, but in the late 1990s, the firm deepened its commitment. “In 1999, we created our own department of energy and that is when we fully engaged in resource conservation. We set some very aggressive goals to reduce the amount of water we use by 50 percent, the amount of gas by 30 percent and the amount of electricity by 25 percent. Utilizing the same runways we had in 1999 compared to what we are using today, we are saving about $80 million to the bottom line of the company. It’s yielding good results for us,” observed Halvorsen. Additionally, the company created an environmental strategy for its fleet to reduce fuel consumption 50 percent by 2020. Halvorsen admits that investing in modern technology is also affecting the price of its products: “We can maintain the price; we invested a lot in this, but the history of our investment is reaping the reward through the future. We use Casa Grande as a learning laboratory and learning facility, with research and development opportunities.” Further on, all 36 plants in the U.S. and Canada developed their own ‘near net zero’ plan. Not all can achieve what the company was able to pull off in Casa Grande, but the learning process and implementing technologies where possible -- that's what counts. “We challenge them and share the learning from this plant,” Halvorsen said. The Casa Grande plant serves as an "environmental learning lab." Moving forward, Frito-Lay will leverage key learning from the Casa Grande plant and apply that learning to other facilities where appropriate, significantly reducing its environmental footprint. “Our approach to significantly reducing the use of natural resources and the environmental impact of a manufacturing site has been cutting-edge. 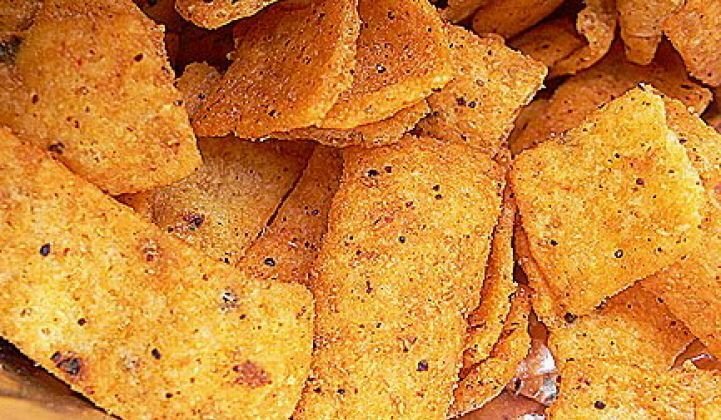 Today marks a major milestone for Frito-Lay and PepsiCo,” he added.